A heat recovery ventilation system works by extracting moist and stale air from wet rooms in your home, it recovers the usually lost heat from the extracted air. It also supplies clean, filtered fresh air that is heated from the recovered warmth of the extracted heat. 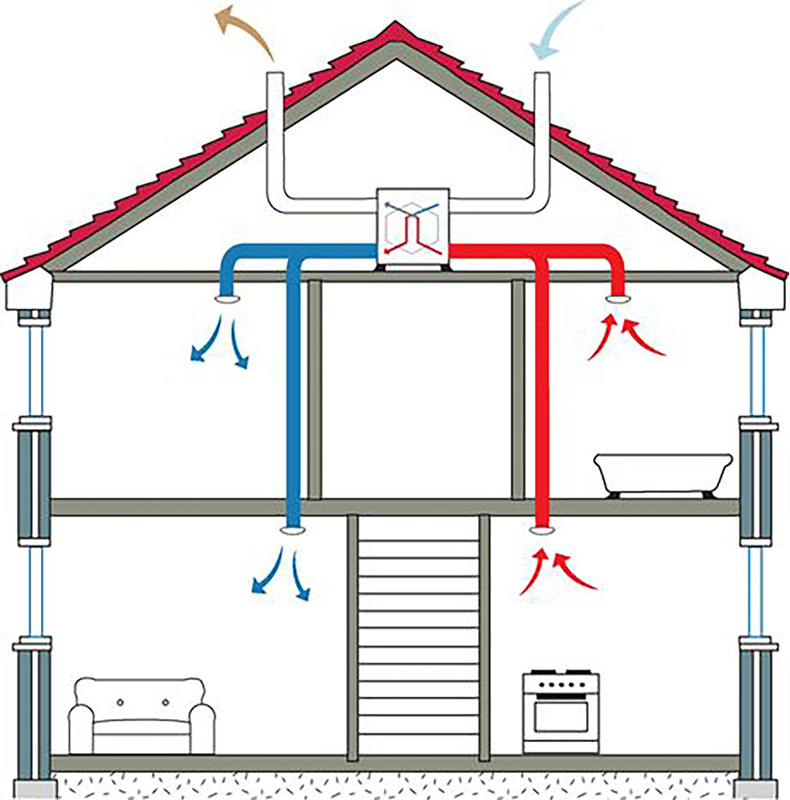 A heat recovery system works (also called HRV or MVHR) via a heat recovery ventilation unit which is usually located in the attic, roof space or plant room of a building. Rather than just extracting air and replacing it with the air from outside, a heat recovery system draws the heat from the extracted air and passes it to the air which is being filtered in from outside. The extract and supply air do not flow within the same pipes and there would be no cross contamination of the different air flows. The heat recovery unit is connected to room air valves via a network of ducting throughout the building. With a heat recovery system, you make use of what already exists as well as reduce our collective impact on the environment, and that includes the amount of heat we lose to the environment daily. Heat recovery systems work by using the valuable warm air or water in a property and use it in a positive way. A heat recovery system works independently of your normal heating system, in each room there are ventilation valves with filters that supply air in and out of each room which all leads to the heat recovery unit. The unit works by moving the stale air through the pipes whilst drawing in cold air from the outside via other ducts. The two airflows pass one another within the heat recovery unit without mixing physically, the heat from the extracted air is then transferred to the new fresh air brought from outside and supplied through the pipework and into each room. Once the stale air’s heat has been extracted and it is then extracted out and into the atmosphere. How is a heat recovery system beneficial? A heat recovery system is beneficial as everyone wants their house to be as airtight as possible to get the most out of their heating, however, this can cause poor air quality due there being no sources of natural ventilation. Having an airtight building with and no ventilation leading to poor indoor air quality can significantly increase the effects of asthma and other respiratory problems. Other issues that can be caused as a result of poor indoor air quality are condensation, mould, dust mites, unpleasant smells and the build-up of toxic gases. If you install a heat recovery system it will extract the moist, stale air from all the wet rooms in your house and replace it with clean, filtered, fresh, warm air to all your habitable rooms and bedrooms without letting the heat escape. Your home will be fully ventilated throughout the year with as much as 95% of the normally wasted heat being recovered providing you with substantial energy savings. Having a heat recovery system installed allows your property to stay air tight with no window vents or bathroom extractor fans required, this creates a healthier, cleaner and quieter environment. With technology moving forward into greener energy, heat recovery systems are a perfect example of how we are trying to improve our own quality of living as well as being energy efficient. A heat recovery system helps the air circulate within a building by replacing it with colder air that is warmed by the ventilation system. Over the years the technology for heat recovery systems has vastly improved and there are now systems available that profess extract up to 95% of the heat from stale air and return it to the fresh air that is circulating back into the system. Some of the key benefits of a MVHR is that they reduce dust and pollen throughout the house and are collected via a filter within your system. They greatly reduce moisture, condensations and smells cause by cooking as well as greatly reduce energy usage with your home. Reducing moisture and condensation will in turn reduce risks of damp and mould throughout the home. A heat recovery system can certainly save on energy bills and keep you warmer in the winter. New build houses can boast up to 30% savings on heating bills. Installing a heat recovery system could save on energy bills and help keep the house warm during the winter months. It costs money to heat our homes but if we open a window or a door that warm air simply goes out into the atmosphere. With a ventilation system you have a constant supply of warm, fresh air circulating throughout your home. For businesses and industry on the other hand, heat recovery helps make the work place a far more efficient place. Nowadays most heat recovery systems behave smartly, reducing the amount of heat that is extracted during the summer months so that comfort levels are maintained or instead can be used for drawing more heat from areas such as a kitchen or wet room where the temperature is likely to be higher. In offices or working buildings they can be used to keep workers cool during the summer months and warmer in the winter without the need to open windows are use heaters wastefully. Read More about the Benefits of Heat Recovery Systems. The maintenance of a heat recovery system is virtually none as all you would have to do is change the filters within the system once or twice a year. The MVHR system constantly provides a high quality of air throughout your home, as the air is being filtered before being distributed it tends to be dust free. As leaders in the design and if required installation of both domestic and commercial heat recovery systems we can help you by proving a high quality, quiet system at the best possible cost. 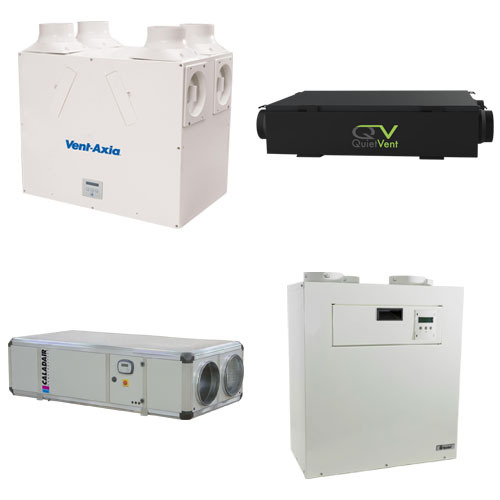 View our large range of heat recovery units and kits at affordable cost. BPC have a large range of easy to install DIY kits that come supplied with detailed plans and installation instructions allowing you to both save money and insure your system is installed correctly. Read more on our DIY kits. For more information on how heat recovery systems work and for more information on our products call our sales and technical team on 028 2827 5150 and we will be happy to help! Alternativity you can visit our website for our range of products.